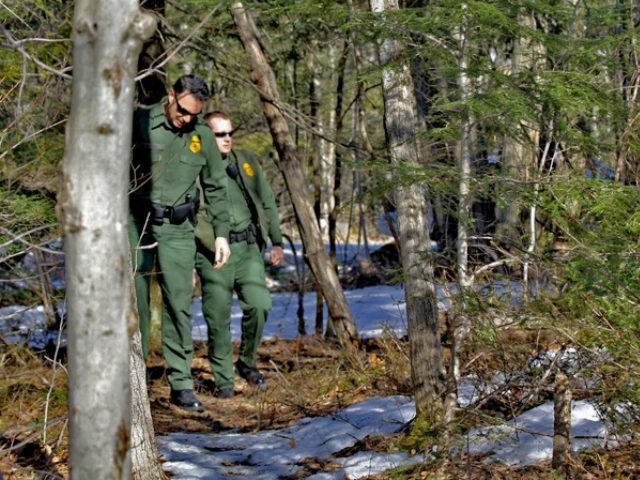 Border Patrol agents in Vermont busted a human smuggler who allegedly helped a Greek national cross the Canadian border illegally. Daniel Larmand was arrested on Friday afternoon after he allegedly helped a Greek national enter the U.S. illegally from Canada. A criminal complaint filed in federal court on Monday revealed that Royal Canadian Mounted Police (RCMP) witnessed an older model SUV approach the U.S. border late Friday afternoon, according to information obtained by Breitbart Texas from U.S. Customs and Border Protection (CBP) officials. The vehicle reportedly stopped just north of the border and let off a passenger. The passenger then walked across the Canadian/U.S. border near the town of Alburgh, Vermont. RCMP officials notified the U.S. Border Patrol who quickly dispatched agents to the area of the suspected illegal crossing. Within a few minutes, agents located the person walking from the border and detained them. Border Patrol agents determined the illegal alien was a Greek national and took the person into custody. No other description of the illegal immigrant was given by CBP officials. He reported that two agents assigned to the Swanton and Champlain Border Patrol Stations were dispatched to the area and encountered the man who had illegally crossed the border. The man admitted that he was a citizen of Greece and presented an identifying passport. An entry stamp revealed he had entered Canada on November 20. He admitted that he had crossed the border to travel to Astoria, New York to visit family. He claimed his intent was only to stay about 10 days. About that same time, Larmand crossed the border at the Alburgh Port of Entry. He presented a Canadian Native American identification card. When asked for additional information, he presented a Canadian driver’s license, Riddell stated in the criminal complaint. Officials allowed him to enter the U.S. under his Native American status. Larmand arrived at the scene where the agents had detained the Greek immigrant. Agents approached the Chevy Blazer and began to question Larmand. He continued his claim that he was headed to Rouses Point to have dinner and look at a boat. He told agents he was going to meet “Mr. Smith,” the criminal complaint stated. When asked for a phone number for “Mr. Smith,” Larmand said he didn’t have a phone number because they had only communicated via the internet. He claimed to be an unemployed Canadian who was on leave from work because of Cancer. Agents asked if he was in the area to pick up anyone. Larmand allegedly denied that he was going to give anyone a ride. He also denied giving anyone a ride in Canada. About that time, the Greek national visually identified Larmand as the man who had dropped him off at the border. Agents again asked Larman why he was in the area. Larman admitted that he was going to pick up the illegal alien and transport him to Rouses Point. Agents asked Larmand if he was being paid for this. Larmand denied being paid but admitted he was carrying $6,000. He said he was carrying the money to buy a boat engine, the criminal complaint states. Larmand had earlier said he was only going to be looking at a boat and that if he liked the boat, he was going to wire the money from Canada, Agent Riddell stated. Agents challenged Larmand on his previous claim and then became nervous. He then stated that he “always has money on him when he comes to the United States,” the criminal complaint stated. The agents then transported Larmand and the Greek national to the Swanton Border Patrol station for processing and read Larmand his legal rights. Biometric information confirmed the identity of both men. After being read his rights, Larmand admitted that he was $25,000 in debt from gambling to a man named Graigue. He said he was asked to help the Greek man cross the border illegally in exchange for the gambling debt. He then claimed that the money in his possession $3,450 USD and $1,175 Canadian, was proceeds from gambling winnings that he had just won at the Akwesasne casino in Canada. The Greek man claimed that he had previously met Larmand and considered him to be an acquaintance. He stated that a family member had paid Larmand $1,000 at an earlier meeting to smuggle him into the U.S.
Border Patrol agents arrested Larmand and charged him with “alien smuggling.” The charge carries a possible penalty of up to 10 years in prison and a fine of up to 250,000. Larman appeared before U.S. District Court Judge John M. Conroy on the charge and was released pending a later court hearing, according to a statement from the U.S. Attorney for the District of Vermont. The Greek national remains in custody as a material witness. Following proceedings against Larmand, the Greek immigrant will be processed for removal and will be barred from reentry as a result of his illegal border crossing. “These arrests are a direct result of the coordinated efforts between Swanton Sector agents and our law enforcement partners to disrupt human smuggling while securing our nation’s northern border,” Chief Patrol Agent John C. Pfeifer said in a written statement.